Paul went to preach the gospel in Lystra after persecution drove him from Iconium(Acts 14:2-7). There he performed many miracles, such as healing a lame man and surviving a stoning (Acts 14:8, 19). It is likely that Lystra was the first time in Paul's missionary work that he was teaching Gentiles the gospel of Christ without approaching them through the common ground of Judaism. There were some gentiles who believed on his words, and he organized them, but then had to leave because of persecution. He encouraged them to be steadfast. On his second missionary journey (Acts 16:1) he returned to Lystra and met Timothy, a young disciple who became his and Silas's companion on the rest of the second missionary journey. She had taught her son about the scriptures from a young age. In 2 Timothy 3:15 Paul says this to Timothy, "...from a child thou hast known the holy scriptures, which are able to make thee wise unto salvation through faith which is in Christ Jesus." She, along with her Timothy's grandmother Lois, were the first in their family to convert to Christianity. In speaking to Timothy Paul mentions "...the unfeigned faith that is in thee, which dwelt first in thy grandmother Lois, and thy mother Eunice; and I am persuaded that in thee also" (2 Timothy 1:5). We don't know whose mother Lois was, it may have been Eunice's mother or her mother-in-law. All we know is that Lois was Timothy's grandmother. We don't know if her husband converted to Christianity but from Paul's wording in Acts 16:1 it seems unlikely that he did. In speaking about Timothy Paul described him as, "the son of a certain woman, which was a Jewess, and believed; but his father was a Greek." If Eunice's husband had also converted to Christianity it seems strange that Paul would specify that " a Jewess" believed but then make reference to the husband separately, indicating perhaps that he didn't share his wife's belief. In fact, we don't even know if he was alive at the time or not. She may have faced family disapproval from her inter-faith marriage. In Deuteronomy 7:1-3 it the Lord commands, "You shall not intermarry with them: do not give your daughter to their sons or take their daughters for your sons. For your children will turn away from me to worship other gods." In Orthodox Judaism people who intermarried (a Jew marrying a Gentile) were considered "dead" to a family. One website I found said that "intermarriage... was viewed as an act of rebellion, a rejection of Judaism. Jews who intermarried were essentially excommunicated." This meant that if Jew chose to intermarry that they may have been totally cut off from their family, having no interaction with them, and even having their name taken off of the family record. The greatest fear behind intermarriage was that a couple's children would not be raised Jewish. This fear was somewhat founded because in Biblical times (and even today) most Jews from inter-faith marriages did not identify themselves as Jewish. This can be seen with Timothy who was not circumcised which may be evidence that he was not raised in a Jewish home. Furthermore, before he is able to travel with Paul he has to be circumcised in order for the Jews in the area to listen to him. This is more more evidence that Timothy may have been identified as a Gentile by those around him. We don't know much about why Eunice was in the marriage she was in. Part of me likes to imagine that hers is a highly romantic story-- a young Jewish girl falls madly in love with a dashing Greek man and forsakes her family, her country and her religion to run off with him to Turkey. Probably not even remotely close to the truth... but it would make for a good novel. No matter what her story she was in an unusual postion for a 1 century Jewish woman and her circumstances would have been different from the women around her. I think in view of this, her story is a valuable one for women who are in relationships where their partner is of a different faith than theirs, or one in which their partner has lost his faith or become "inactive" in the gospel. Even though she didn't have the support or guidance of her husband Eunice still taught her son, Timothy, the scriptures and instilled in him the ability to recognize and feel the spirit. Modern women, who have the scriptures at their fingertips, may not comprehend the significance of her accomplishment. In Eunice's day scripture reading was a purely male activity. The scriptures, or the Torah, were kept in the synagogue and scripture reading was a male's privilege and responsibility. The only time women would have heard the scriptures was when it was read to them in synagogue or recited to them by men who had memorized them. Most women would also have been illiterate and so even if they had scriptures they would have been unable to read them. Some Jews even believed that it was improper and obscene to teach women the scriptures. In view of this it is remarkable that Eunice was able to teach her son the scriptures well enough that Paul would remark "from a child thou hast known the holy scriptures." Most likely she taught her son from her memory, reciting the the scriptures and the stories she had learned in her youth. It is possible that she might have been in a situation to have a copy of the scriptures and the ability to read them, but such a situation would have been very unusual. 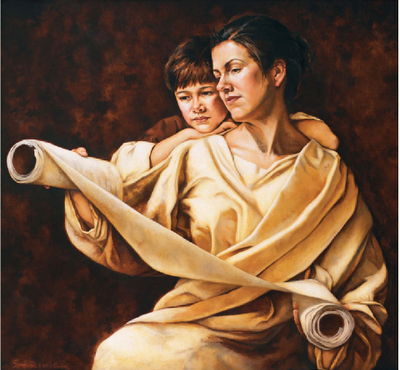 In addition to teaching her son by herself she also she found way to nurture her spirit and to keep herself spiritually awake so that when Paul came with the good news of the gospel she was prepared to hear and accept it. It was her example, combined with Lois's, that inspired Timothy and prepared him become the great missionary that he was. God bless you wonderful mothers and fathers in Zion. He has entrusted to your care His eternal children. As parents we partner, even join, with God in bringing to pass His work and glory among His children. It is our sacred duty to do our very best." Eunice may not have been in the "ideal" situation but it was where the Lord had placed her and she did the very best she could. I think she is such an example for all women, no matter what their situation, who are struggling day by day to raise and nurture children in the gospel and to love and sustain their husbands. She teaches us that the influence of a righteous woman, who loves the Lord, and who dos the best she can will accomplish great things...even if sometimes she has to do them by herself. What was it about her life and her personality that prepared her to hear and accept the gospel of Christ when so many around her didn't? What challenges would she have faced in a inter-faith marriage? How did she raise her son so that he too would be prepared to hear the words of Christ? How do you, or a couples you know, who have inter-faith marriages make it work? What sort of benefits/disadvantages do such marriages have? Aren't you glad you live in a day and age when we have the scriptures so readily available and women are allowed to read them? I don't think we realize how different women's lives are today than they were 400, 200 or even a 100 years ago. Count your lucky stars ladies. I love this post today. You are so right. The roles of women have changed so much, even in the past 50 years. Some for the good, and some for the not so good. I have come to believe that anyone in an interfaith marriage must be very strong. I would like to believe that she loved her husband enough to make it work. It is so hard when you both believe different things. I am fortunate that I am not in that situation, but my sister is and I know that she has made many compromises in order to make it work and be happy. The best thing about their relationship is how much they support and love each other and the kids. All of her kids were raised in the church with love and support for their own decisions.